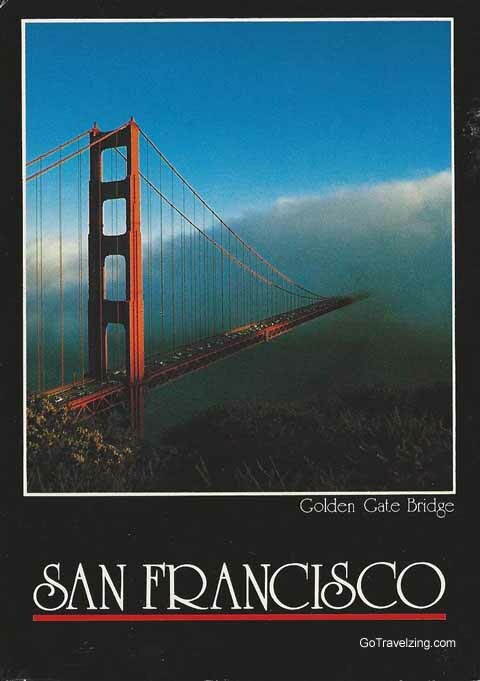 This postcard of the Golden Gate Bridge in San Francisco California was sent in 1984. It was sent by me to my parents when I was on a bus trip across the western United States. According to what I wrote on the postcard I visited Alcatraz, Pier 39 and the Wharf. I was also unhappy that I did not get to ride the Cable Cars. The postcard has an interesting picture of the bridge disappearing into the clouds. That is a great picture of the bridge. It brings back memories of my weekend there over a decade ago. We just had to ride over the bridge for the experience. I also enjoyed the Wharf and a boat ride around the harbour. I remember the noise of all the seals/sea lions which had come ashore/on the rocks. They made quite a noise but were great to see.